I helped my neighbor replace a motor on his boat lift. Usually these are the typical 6 wire motor on a drum switch. (4 wires to the motor) This one was still the 6 wire motor but there were only 3 wires to the motor. After a lot of head scratching and looking into the controller, this is what I figured out. Does this look normal? It does work. It's new to me but I can't see why it wouldn't work. I found this boat lift motor diagram that looks like it may similar be what you have. I had one for a 'friend' on the bay side of the barrier island. He took it apart, & tried really hard to see how bad he could screw it up. Wound up exactly as your diagram & works well. That is the normal 4 wire thing you see on the Furnas site for a drum switch. They are doing this with 3 wires. The difference is the start winding is in series with one of the run windings. I haven't noticed any loss of starting power but it has to be getting less "kick". John, let me guess, this was a remote control lift? You got it! A strange setup, but it works! He was an office guy, that likes to think that ECs make to much $$. He changed his outlook when I lifted his week old Pursuit up & down! He was playing with the wiring for two days before the 911 call. Windings #1-#2 + #3-#4 are the Split Coil Main (Run) Windings. Appears to be a Dual Voltage ("Low Volts" = 120V, "High Volts" = 240V) 1 Phase Capacitor Start Induction Motor, setup for "High Volts" (240V) Input. The Auxiliary "Start" Circuit (Winding, Capacitor & Start Switch) connects to the "Center Tap" point of the Main "Run" Windings. This results in 1/2 the Motor Terminal Voltage across the Start Circuit - or 120V. Look sort of familiar??? Works the same as the 120/240V 1 Phase 3 Wire Transformer feeding it! With the Start Circuit connected via the Center Tap, the Capacitor may be rated for 120V, even though the Run Windings may be connected across 120V or 240V. As to the Connections Scheme, the "Key" to proper connections (per "Forward" and "Reverse"), is to "Make" the Start Winding reduce the Mag. Field Strength on One "Side" of the Run Winding. This is what determines the Startup Rotation. 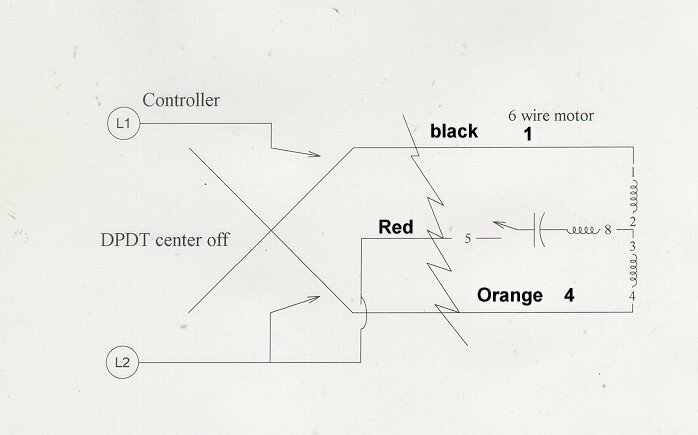 Using Greg's Schematic example above, Connecting the Start Circuit Terminal #5 to "L2" will start the Rotor in the Counter-Clockwise Direction (normal "Forward" direction). The Start Winding reduces the Field on the "Lower" Winding Section (#3-#4), causing the Rotor to "Fall" in that direction. Connecting the Start Circuit Terminal #8 to "L2" will start the rotor in the Clockwise Direction ("Reverse" direction). The Start Winding reduces the Field on the "Upper" Winding section (#1-#2), causing the Rotor to seek that direction. BTW, if this Motor is a PSC (Permanent Split Capacitor) type, no Centrifugal Start Switch will be included in the Auxiliary Circuit, and the Auxiliary Circuit is always connected to the AC Input during Motor Operation. This is what the manufacture has in his instructions so you can see it was hard to make the leap to what they had. A+ to the guy who figured out the wiring the way you found it. I wonder about the instant reverse switch, though.